Norway’s central bank refrained once again from raising interest rates on Thursday but now states that it’s “likely” to do so in September. That in turn can boost the value of the country’s currency, the krone, which already is expected to strengthen significantly against the US dollar next year. That’s if the predictions of investment bank Morgan Stanley are correct. It reported bright prospects for the Norwegian krone in its latest currency exchange report, citing a decision by the central bank (Norges Bank) to sink its inflation goal from 2.5 percent to 2 percent and an outlook for stability ahead. That will support the krone, as will Norway’s continually recovering economy following the oil price collapse in 2014. Morgan Stanley noted that the krone has weakened considerably against the dollar in the past month, mostly because the dollar itself was boosted by strong economic data from the US. It cost NOK 8.13 to buy a US dollar on Tuesday and nearly NOK 8.16 on Thursday. Soon it’s expected that the US dollar will weaken against the krone. Norges Bank itself noted on Thursday how the Norwegian “upturn” in the Norwegian economy is continuing, capacity utilization appears close to normal “and is likely rising faster than expected earlier.” Inflation is also lower than targeted while unemployment has fallen once again, with Prime Minister Erna Solberg noting this week that employment levels are now so high there may soon be a need for foreign labour again. Norges Bank’s Governor Øystein Olsen also stated Thursday that the bank’s “current assessment of the outlook and balance of risks suggests that the key policy rate will most likely be raised in September 2018.” Economist and Professor Hilde C Bjørnland at Norwegian Business School BI in Oslo thinks an interest rate hike can’t come soon enough. “We have an upturn in the economy and the housing market is gaining speed again,” Bjørnland told DN. She’s been worried that the central bank’s key policy rate, which has been unchanged at just 0.05 percent since March 2016, has been lying long for too long. “At some point we’ll have a downturn,” Bjørnland said. “We won’t have anything to work with if interest rates stay as low as they are.” She was hoping Olsen and his executive board would raise rates this week, but only if it had been tipped well in advance. Now Olsen has clearly stated, and prepared the market that interest rates “likely” will rise in September, if cautiously. Rate movements before the key policy rate fell to 0.5 percent had only amounted to around a quarter-point. That can also boost the krone, with Morgan Stanley predicting that a US dollar will “only” cost NOK 7.77 this summer, NOK 6.76 next summer and NOK 6.59 by the end of next year. 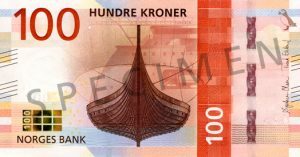 The krone is expected to stay fairly stable against the euro, though, which cost NOK 9.43 on Thursday afternoon and is predicted to cost NOK 9.50 at the end of the year.